> New Goodman story at The Dunesteef! 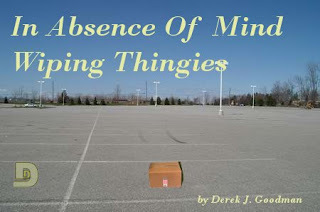 Writer Derek J. Goodman ("Northern Girls With the Way They Kiss," M-Brane #4, "Rental Property," forthcoming in #6), has his new story, "In Absence of Mind Wiping Thingies," live right now in The Dunesteef Audio Fiction Magazine. There are a bunch of cool audio fiction sites nowadays, and Dunesteef is one of the coolest. It stands to reason that I would think so since it appears that its editors and I have at least a fair amount in common as far as the kinds of stories we like. In addition to Derek, I have heard that M-Brane #2 alum Abby "Merc" Rustad ("Unpermitted") has something going up there shortly. Also, I noticed that S.C. Hayden ("End Day," M-Brane #3) and Joshua Scribner ("Conductors," M-Brane #1, "Tortured Spirit," #5 forthcoming) have been published there as well. I really need to somehow make more time to actually listen to and pay attention to more audio fiction: I am constantly playing some of it, but get too distracted by trying to write or edit or blog or email or Tweet at the same time and I miss most of the story. I need to treat myself to some uninterrupted periods of kicking back and just listening. Dunesteef and all "my" cool writers with stories there are inspiring me to do exactly that. Yup, a small chunk of time to just relax and listen (kinda like kicking back and watching some TV once in awhile) is definitely needed now and then--and well-deserved. :) I hope you can fit it in there! Thanks for the plug, Chris! Don't feel bad. I have a whole blort of audio fiction from various sites on my computer that I haven't listened to yet. Same reasons- I just can't concentrate on it while doing something else, so I have to wait for down time, which is this rumor I keep hearing about.